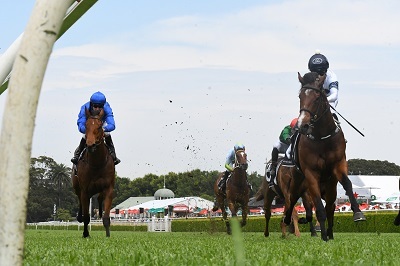 Gary Portelli admitted to feeling the pressure with Time To Reign, the relation to She Will Reign, in the Forum Group Kirkham Plate (1000m) at Royal Randwick. The two-year-old wobbled his way down the straight but held a comprehensive margin at the finish to beat Godolphin colt Bivouac. “You’ve got a potential stallion on your hands being a half-brother to a Golden Slipper winner, that can gallop, so you don’t like to see them get beat at their first start,” said Portelli. The overriding sentiment from both Portelli and jockey Rachel King was that we haven’t seen anywhere near the best of the colt yet. “He has never galloped away from home. You’ve got to understand they aren’t humans, he wouldn’t know where the winning post is today. He kicked clear but didn’t know where to go. He hasn’t worked at a different track in his life,” reiterated Portelli. “There is plenty of upside and we’re talking about heading down to Melbourne for the Maribyrnong (Plate) but we’ll see how he comes through today. He is going to be a really nice horse next preparation. As for the inevitable comparisons to She Will Reign, Portelli doesn’t have any concern about Time Will Reign, who gave his sire Time For War his first winner, stretching out to the 1200m. “She was a bit shorter and at the same time of year I thought she was an 800m horse. I didn’t know if I’d be able to get her out to 1200m but this bloke has always shown he’d be strong. He has got a bit more length about him and is more relaxed, more tradesman-like,” Portelli said.